OTTAWA -- A pair of Ray-Ban sunglasses. A limited edition, painted leather clutch. Beauty products, glittering jewelry, shoes, luggage, children's clothing, sporting accessories. 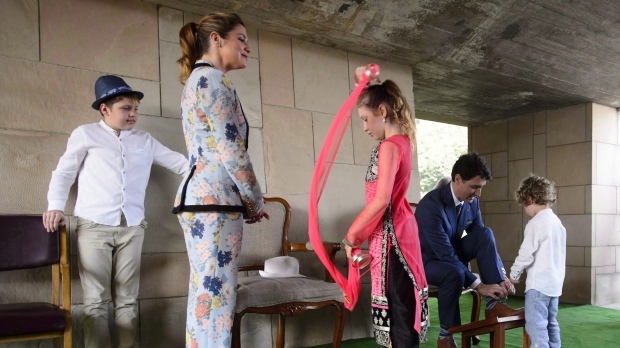 But a growing trend among the high-priced offerings to the prime ministerial family are gifts from private companies -- clothing and accessories from Canadian designers hoping the famous family will sport their wares in public. Canada's Conflict of Interest Act has only been in force since 2007, and has therefore governed only two prime ministers and their governments -- those of Trudeau and Stephen Harper. Last year, former ethics commissioner Mary Dawson found Trudeau broke Canada's ethics laws by accepting two all-expenses-paid family trips to a private Bahamian island owned by the Aga Khan, head of a charitable organization that lobbies the federal government for funds. Hard-shell carry-on luggage pieces for Justin Trudeau and his wife from Herschel Supply Co., B.C. Blue dress given to Sophie Gregoire Trudeau from Montreal designer Daniel Leinad. Pink bomber jacket given to Gregoire Trudeau from Toronto designer Aleks Susak. Sports accessories for the family from Quebec-based Kombi Sports Inc.
Scarves from Toronto designer Leo and Clive for Gregoire Trudeau. Two angora and velour hats adorned with amethyst for Gregoire Trudeau from Toronto designer Sharon Snitman. Clothing for the Trudeau children from B.C.-based Peekaboo Beans Inc.
MILCK clutch and editor's pouch to Gregoire Trudeau from Toronto director of Holt Renfrew, Alexandra Weston. Gift basket containing Jack Daniel's products from Canadian Whisky brand ambassador Alexis Green. Huawei Mate 10 Pro Android phone for Justin Trudeau from Li Keqiang, premier of the People's Republic of China. This gift was forfeited.